Coarctation of aorta (CoA) is a congenital heart disease that can lead to heart failure during infancy and neonatal period. Several treatments have been proposed for this disease, including surgery and balloon angioplasty. The experiences of using stents in small infants or neonatal patients are very low. In this article, we report a 3 months old age infant who after balloon angioplasty, his CoA symptoms had return and stenting of CoA was performed for him. Coarctation of aorta is a congenital heart disease that can lead to heart failure and severe symptoms if it occurs during neonatal and infancy periods. Severe CoA is one of the critical neonatal diseases that can be manifested by heart failure, shock, and subsequent other organ failure. In severe cases that appear at the neonatal or infancy period, the severity of the stenosis may be such that physiology is similar to the interrupted aortic arch, and the baby's life depends on the opening of the arterial duct. In these patients, prostaglandin is prescribed to help open the ductus arteriosus to time for appropriate treatment. Different methods have been proposed for the treatment of these patients, which can be described as balloon angioplasty or surgical approaches. 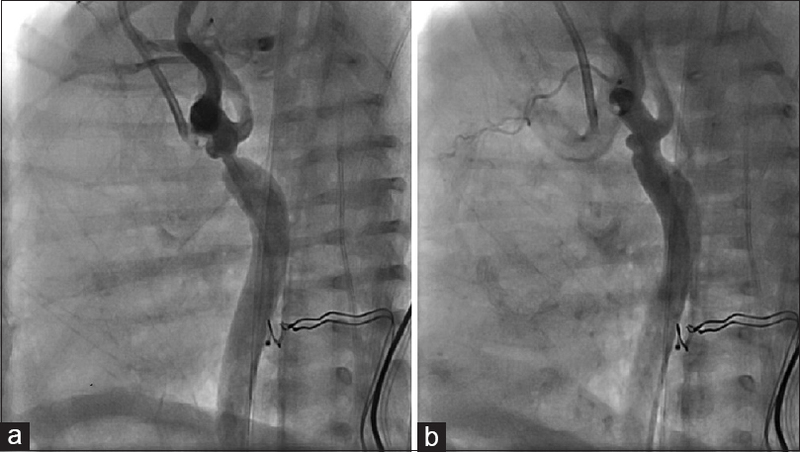 In this article we describe treatment of an infant who had a history of balloon angioplasty of severe coarctation of aorta and did not respond to treatment and was underwent coarctation stenting. A 25-day-old boy, weighing 3 kg, with tachypnea, heart murmur, and pulse reduction in the lower limbs was referred to our center for evaluation (Shahid Chamran Hospital affiliated to Isfahan University of Medical Sciences). In the clinical examination, the pulse of the lower limbs was reduced in comparison to the upper extremity. Increasing size was observed in chest X-ray, and in electrocardiography, left axis deviation was observed. Echocardiography evaluation showed severe coarctation of aorta (CoA) after the left subclavian artery. Patient consent form has been obtained. In this patient, the ejection fraction was 20% and the cardiac function was reduced. Peak pressure gradient was 30 mmHg at the site of CoA, and severe stenosis was observed in the area. We decided to do angiography, and the patient was transferred to the catheterization laboratory. Angiography was performed under general anesthesia, and the patient was electively intubated and mechanical ventilation. According to standard protocols, femoral arterial angiography was performed for doing the procedure. One hundred and fifty units of heparin (50 units/kg) were initially injected at the beginning of the procedure and subsequently injected with activated clotting time control over 200 s. Injection in the lateral view was performed in the aortic arch and ascending aorta, and the anatomy of the aortic artery and the stenosis zone were determined. Balloon angioplasty using high-pressure balloon was performed three times [Figure 1], and pressure gradient decreased to about 10 mmHg. Aortic injection after procedure showed increase in blood flow and increase in the size of the stenosis. The cardiac function improved and the patient's general condition also improved. During angiography, 150 mg of cefazolin was injected, and in the next 24 h, 100 mg of cefazolin was injected every 8 h (100 mg/kg/24 h). The patient did not have any immediately or acute complications during or after angiography and did not have any chronic complications during the follow-up. In the follow-up, cardiac function improved and ejection fraction increased to about 65%. About 2 months after angioplasty, the patient was re-evaluated, which increased the gradient in the CoA area and had pressure gradient of about 50 mmHg. In second time evaluation, he had 6-kg weight. We decided to do once again angiography and re-evaluation for the patient. During the angiography, severe stenosis was observed again on the site [Figure 2]a, and according to the anatomy of the site, we decided to use the stent for CoA correction in this patient. A 17 mm × 8 mm Cook formula stent, USA, was used in this patient. For implantation of stent, we need at least 7- or 8-French delivery system, and it had possibility of the risk for injury to the patient's artery; then, we decided to do the procedure for the patient without using the delivery system. We used a radial sheath no. 6 French to prevent arterial injury. On the monitor, for better result, we marked the placement of the stent using the pen, and after changing the wire, the stent was moved to appropriate place slowly over the wire. After ensuring that the stent is positioned correctly, we opened the stent up to 8 mm using the balloon inflator [Figure 2]b. Finally, in the lateral and anterior-posterior views, the injection was performed, and we ensured the increasing size of the stenotic site and the absence of complications such as arterial dissection. The gradient dropped to 5 mmHg, and the patient was transferred to the intensive care unit. During the procedure, the patient received 50–100 IU/kg of heparin and was treated with heparin for up to 24 h, at a rate of 300 units every 6 h (50 IU/kg/6 h). Appropriate antibiotic was administered to the patient during the postprocedure. Acid Salicylic Acid (ASA) was prescribed 30 mg daily for up to 6 months, and clopidogrel 1 mg/kg/day was prescribed for 1 month. There was no increase in gradient in the subsequent follow-up, and the patient's general condition was also good. His body weight was increased to 9 kg during the 6-month follow-up, and developmental stages were improved. He had no tachypnea or other heart failure symptoms, and lower-limb pulses were increased. Vascular complications or other complications were not observed. Severe CoA is one of the critical neonatal diseases that can be manifested by heart failure, shock, and subsequent other organ failure. In severe cases that appear at the neonatal or infancy period, the severity of the stenosis may be such that physiology is similar to the interrupted aortic arch, and the baby's life depends on the opening of the arterial duct. In these patients, prostaglandin is prescribed to help open the ductus arteriosus to time for appropriate treatment. There is a controversy about the treatment of these patients, and in some cases, the surgery is considered the first step. With the advancement of percutaneous methods, balloon angioplasty of CoA was one of the alternative therapies in these patients, and many articles confirmed the effectiveness of this method in these patients. In some patients, despite this method, the local stenosis is repeated and causes symptoms to reappear. In a number of other patients, CoA zone had long-segment property, in which surgical repair is required. Previous treatments of these patients were everywhere, including our area, based on the use of surgical approach, which is why we also use surgical methods for these patients previously. 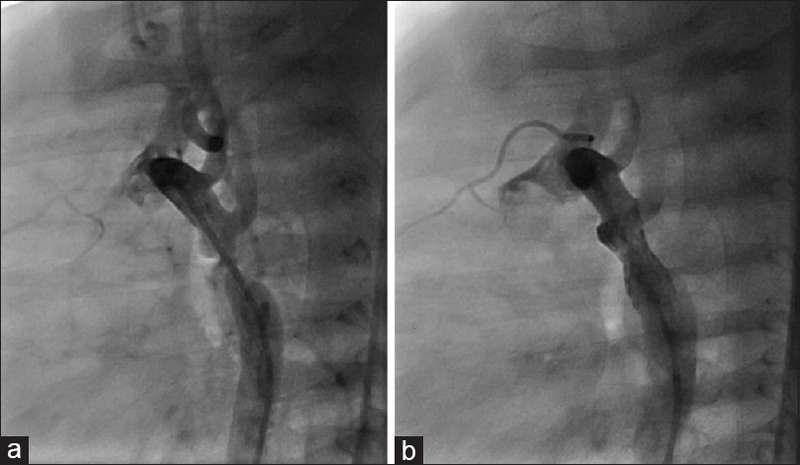 Interventionists had not much experience in these patients, and until now, surgical approaches are preferred to percutaneous balloon angioplasty or stenting. CoA stenting is a choice treatment for the treatment in adult patients with CoA, and if interventional treatment is unsuccessful or if there is existence of contraindication, surgical repair is recommended. In children, the use of stents is restricted in older children because of the continued growth of children and the need to use large sheaths. Kang reported using stent in children <30 kg with an average weight of 20.8 kg. In patients with low weight, using of low-profile breakable stents for CoA stenting were reported by Grohmann in four patients, with a mean weight of 3.8 kg. Long-term outcomes have not been reported in patients, and the stability of the stents has been questioned. Arfi also reported the results of using stents in sick low-weight children who had surgical contraindication. Few reports had published for using of stents in low birth weight infants and small children. In these reports stenting of CoA had performed in sick patients. In our patient, balloon angioplasty of CoA was done first in neonatal period and progression of the CoA reoccurred during follow up. It seemed that the best decision was surgical approach for treatment in this patient, especially considering that the type of disease was long segmented. The low weight of the patient also did not allow the use of conventional stents. With the above-mentioned conditions, we used a low-profile Cook formula stent with a redilation ability of up to twice the primary size. Unlike previous studies, our patients were electively treated with a stent and had no contraindication for surgery. The patient also had less weight than other studies. Unlike Grohmann's study, the stent used in this patient was not breakable and has a redilation ability of up to 16 mm in the future. In this patient, the use of this stent until adulthood may constraint in blood flow, which should be investigated in a long-term follow-up. As the child develops over a lifetime, it is necessary to re-expand the stent to improve blood circulation. There may be a stent fracture over time that should be treated appropriately. According to the available studies, our patient seems to be among the first patients treated in this approach, which should be better investigated with larger studies and more patients. Furthermore, due to the low number of these patients in each center, multicenter studies should be performed to investigate this treatment. Considering the complications of surgery and also the balloon angioplasty in patients with severe CoA during infancy, it seems that the use of stents in selected patients such as long-segmented CoA or patients with CoA restenosis can be an alternative way to treat these patients. McElhinney DB, Yang SG, Hogarty AN, Rychik J, Gleason MM, Zachary CH, et al. Recurrent arch obstruction after repair of isolated coarctation of the aorta in neonates and young infants: Is low weight a risk factor? J Thorac Cardiovasc Surg 2001;122:883-90. Kang SL, Tometzki A, Taliotis D, Martin R. Stent therapy for aortic coarctation in children <30 kg: Use of the low profile valeo stent. Pediatr Cardiol 2017;38:1441-9. Grohmann J, Sigler M, Siepe M, Stiller B. A new breakable stent for recoarctation in early infancy: Preliminary clinical experience. Catheter Cardiovasc Interv 2016;87:E143-50. Arfi AM, Galal MO, Kouatli A, Baho H, Abozeid H, Al Ata J, et al. Stent angioplasty for critical native aortic coarctation in three infants: Up to 15-year follow-up without surgical intervention and review of the literature. Pediatr Cardiol 2018;39:1501-13.